This French inspired dinner was the result of me trying to use up leftovers one night. If you think that steak and eggs are just for breakfast, than you’re missing out. Throw it all on a bed of simple greens dressed lightly with the Primal Primos Classic Lemon Vinaigrette and you’re set! Delicious Paleo Recipe at your finger tips! 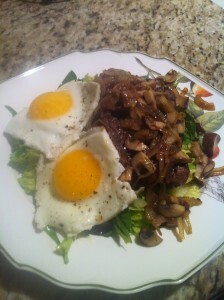 A new take on the classic steak and eggs. Step 1 In a medium sauté pan set over medium-high heat, add coconut oil and allow to heat. Step 2 Add onions, mushrooms, salt and pepper. Sauté until onions are slightly caramelized. Step 3 In another bowl, add romaine lettuce and lightly dress with lemon vinaigrette. Step 4 Using either the barbecue grill or a sauté pan, add oil and allow to heat. Step 5 Place steak on heat and cook no more than medium. Medium rare is optimal. Step 6 Remove steak, and using the same pan, add your eggs, cooking until the whites are firm and the yolks are still running. Step 7 Create a bed of salad on your serving dish, add steak on top, caramelized veggies on top of that and then your fried eggs. STEAK COOKING NOTE: The single most important factor that effects the tenderness of steaks is cooking time. Cooking a steak past medium spells disaster for overall taste and tenderness. Try to cook your steaks between medium-rare and medium to maintain optimal tenderness.